Appearance: Bara stands at 6 foot 2, he has black and white hair. He has an orange eye color. He commonly wears a black/orange/white vest. The right sleeve has armor on the side of it. His left arm appears to be that of an unknown heartless, this is not true, it is just full arm armor. 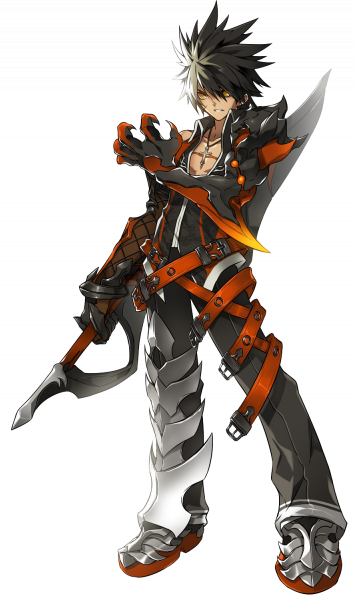 Bara wears black pants with 5 belts, 3 of which are not done and hang over his right leg. His left leg has armor from the thigh to the foot. He wears black boots both of which have orange soles and both have armor on them. Personality: Bara curses his existence. He often uses the word "trash" to describe himself. He views himself as unneeded, empty and expendable. This is why he basically tries to kill himself when he saves other people from dying against a very serious enemy. His monotone voice gives people the impression that he is always serious. Bara doesn’t like other people; he’s fairly anti-social and prefers not to get chatty even with people he knows. Bara however does like to kill heartless, even if they have a human appearance, he will try and kill them. Affinities: Bara, even with all of the armor, is fairly fast. Bara's defense is high thanks to the armor. Weakness: Magic isn't his strong suit, it's actually his weakest point. History: Bara never knew how he really came to be, but then again, does really any nobody actually know who their somebody is? Bara simply woke up in a small desolate island world. He only had one thought in his mind when he woke up ‘Bara’. He assumed that was his name. The island he was on had some homes on it, so that meant that people did live there at one point in time. After looking around the island it was clear that no one had lived on that island for a while. From the shore more islands were visible, but without a raft there was no way to get across to the other islands. Swimming was a possibility but it had to be about a mile or two to get there, just a bit out of range. Bara did want to see the other islands, but he knew that it wouldn’t work. He decided to look around and see if there was a way to another island like a bridge or something. On his travel to the other side of the island something stopped him. Shadow Heartless. He wasn’t sure what they were, and he had nothing to fight against them with. One of them sprang up to try and attack, however, Bara seemed to have other ideas. A large blade appeared in Bara’s hand, it was a slightly dull blade but it would work fine. Using the blade he managed to kill the shadow heartless that had stopped him and the others that tried to stop him on his way to the other side of the island. On the other side of the island was nothing but water as far as the eye could see. The island was small, but it seemed like those heartless didn’t want him to get to the other side of the island. With courage in his heart he walked to the shore line and looking into the water he saw nothing underneath. On the other side of the island the water was crystal clear, but on this side of the island it seemed like there wasn’t actually any water there. It was as if it was hollow. Wondering about this Bara bravely jumped into the water. He only fell… and fell… and fell… Bara soon landed on something hard as if there was a bottom to the darkness he was in. A ray of light eventually surrounded him. And underneath his feet was stained glass, there was no real design to it though, it was all just shades of dark gray to white. After looking at the dark and light colored stained glass circle for a few moments he looked ahead of him and saw a door. Bara couldn’t exactly leave any other way so the door was his only option. After walking through the door he found himself standing in a new town, no, a new world. Twilight Town. Ever sense coming to Twilight Town he has been fighting every heartless that has come across his path. He had also learned that by concentrating enough energy that with the blade he could cut small rifts and go through them to new worlds. Re: Bara, the bladed nobody. Affinities: Bara is very intelligent. Weakness: The blade is fairly hefty, causing his attack speed to be low. This referred to physical strengths an weaknesses. Is he good at magic? Is he fast? Is he strong? Is he weak? Stats are Speed, Agility, Strength, Stamina, Defense, Magic Attack, Magic Defense, and Luck. You can have one more strength than you do weaknesses. Also, all nobody's have the nothingness element. You are free to choose three more if you desire. However, they can not include Light or Darkness. sorry about that. Both the magic and the Affinities and Weakness have also been edited. Just a note: Aero and Lightening are Wind and Electricity respectively here (please review our elements lists, there are three). You can either drop your magical weakness, or add one more strength. I've taken care of both. Keep in mind his the armor will need to be approved separately from the character. As of now, your character has High Speed and High Defense, in addition to Low Magic Attack. Approved, unless you have any objections.